Fretter is a advanced chordfinder. It doesnt rely on a database with diagrams, instead it is a very intelligent piece of software that calculates all the possible diagrams for a given chord/instrument/tuning combination. Its algorithm is optimized to only present to you the chords that you can actually play as a human. 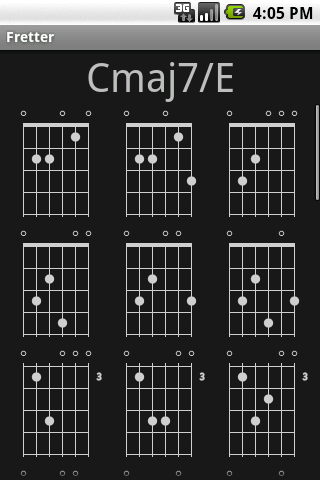 Because Fretter is build this way, it has a lot of exciting possiblities not found in other standard chord apps. For example, you can select any tuning, even custom ones, and still have all the possible chords presented to you. You can easily select a basic or advanced chord, optionally with added bassnote, and go to the diagrams. Each diagram has extra information about the chordnotes, the intervals used, and you can strum up and down to hear how that particular diagram sounds on your instrument. Also included is a reverse lookup option. Nice if you are a bit adventurous and you are coming up with your own chords on the guitar, but dont know how they are called. Fretter can help you here by providing you with the correct naming. 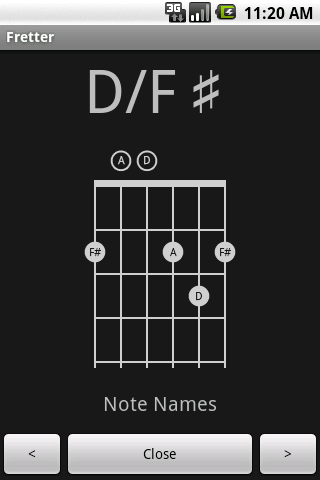 If you are looking for a chord reference app: this is what you need. If you have some valuable feedback to make Fretter even better or some annoying bug, please dont hesitate to contact me by email, or use the Feedback menu option in Fretter. Your help and suggestions are appreciated, since I want to make this app the best there is. You play an essential part in that process. So let yourself be heard. Let me hear what you want from Fretter 2.0! All wild ideas are welcome. With your help, Fretter is going to be the ideal Toolbox for every Guitar/Banjo/Ukulele/Mandolin player! Mario & Yoshi Decal Super Mario Sticker A New Way To Theme Your Android Device.